Create a dazzling do with our sparkling, no-pull ponytail bands. Each one features a glittering sphere of faceted faux gems and a lovely silver-tone bead accents the back. 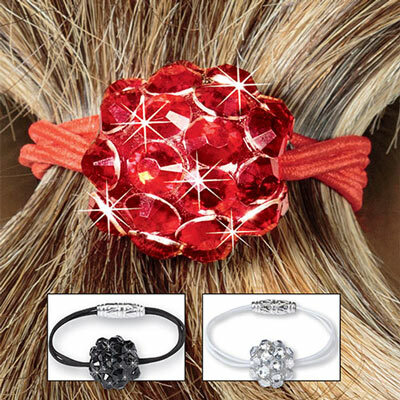 Wear these Dazzling Gems Ponytail Holders separately or together for even more sparkle and pizzazz. Sphere is approx. 1" dia. Set of 3 - Red, Black and Clear.